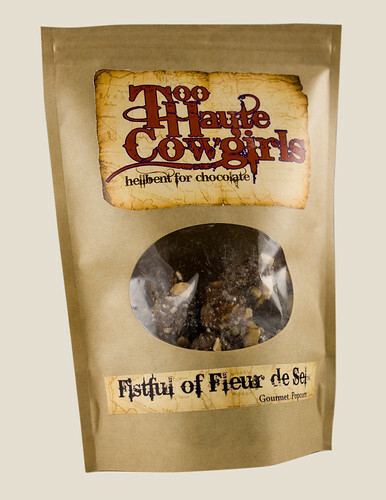 I don’t know how Too Haute Cowgirls came up with such wonderfully crazy flavors for their delicious buttercrunch popcorn but I am thankful for it! A small team of tasters and I tasted every type of popcorn the cowgirls make and were blown away. Check out each flavor below including their white chocolate peanut butter flavor, The Good The Bad And The Peanut Butter. First off, I hope you make note of the excellent names they gave to each of their confections. Second, I absolutely loved this flavor. Even though it was covered in rich chocolate, I could still detect the more subtle notes like the cinnamon and citrus. The mix was nutty, fruity and chocolatey. 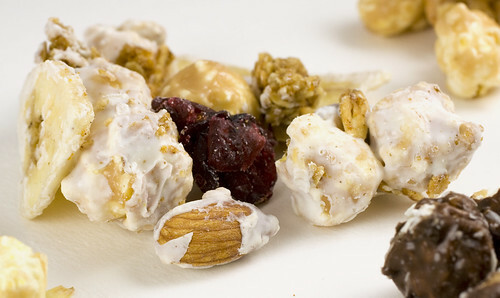 White chocolate-covered granola was a new experience to me, and man was it a good one! This flavor would be great on the trail or even – as the cowgirls point out – for breakfast. Glad I’m not the only one who thinks sweets are welcome in the AM! In Amy’s video interview, the reporter claims that this flavor was, “named after a friend’s comments following a painful bike ride.” Ouch. At least something great came from their pain! Since this flavor is the base for all of their other flavors, you know it’s gotta be good. In Amy’s interview, one of her wholesalers says, “it took one bite to be roped in.” We felt the exact same way. Taste Tester and I each popped a bite and immediately said, “Wow!” This is the cowgirls’ bestseller, and it’s no wonder why. The company is even partnering with mywedding.com at their upcoming bridal shows in Denver (starting April 11) as a result of many requests for wedding favors. As his fiancée, I choose to ignore the last comment, but quite honestly this stuff was so good that I almost understand. Almost! 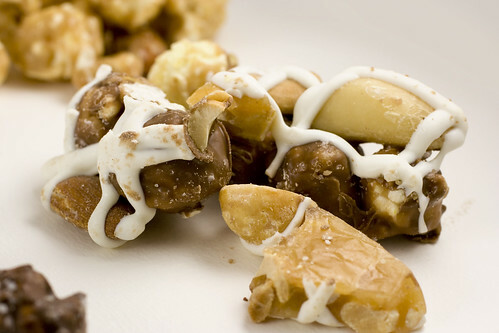 I loved the creaminess from the chocolates and the saltiness from the nuts. I also loved the variety of nuts in this flavor and especially that they used brazil nuts. Such a yummy and underused nut. This wasn’t a favorite among the group of tasters I shared with, but I give it props for being different than any other kind of popcorn I’ve had before. 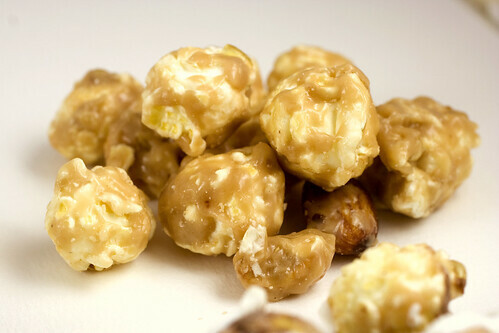 How many of you out there have had coffee flavored buttercrunch popcorn? Not many, I’d bet! Like the coffee, I enjoyed this one because it was different. It’s also well-spiced for those of you that are into a little heat. 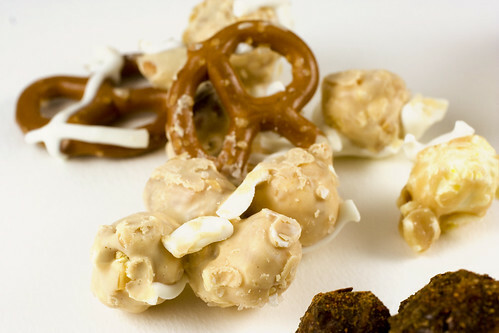 This flavor is salty from the popcorn & pretzels, peanut buttery, and creamy from the white chocolate. Wow – yum. 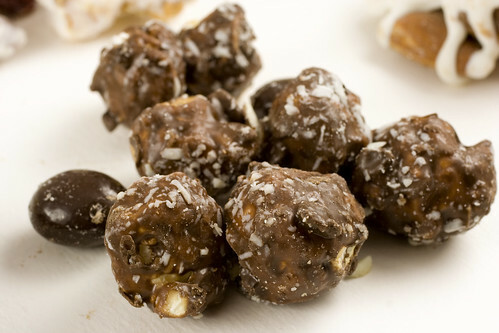 Whatever kind of chocolate they use, it’s very smooth and goes well with the buttery caramel corn. 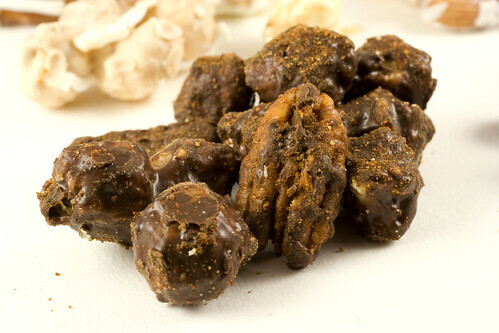 And I like that every bite (of their buttercrunch in general, not just this flavor) is different – one bite is completely covered in chocolate, the next is just the bare classic buttercrunch, the next is a pretzel, and so on. The variety keeps it interesting. This flavor even won an award at a Denver chocolate event. It was so good that it left us begging the question: when will this be arriving at a theater near us? I know what I’d be munching on during the show! 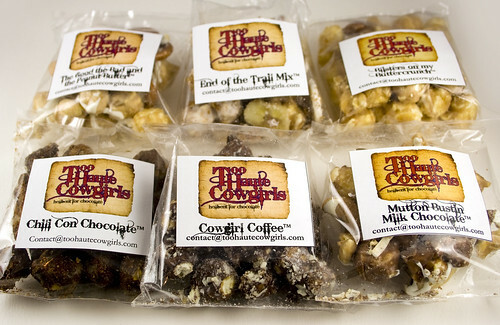 Get yourself some (or all) of Too Haute Cowgirl’s Gourmet Popcorn. This looks so delectable. I want to try every flavor!